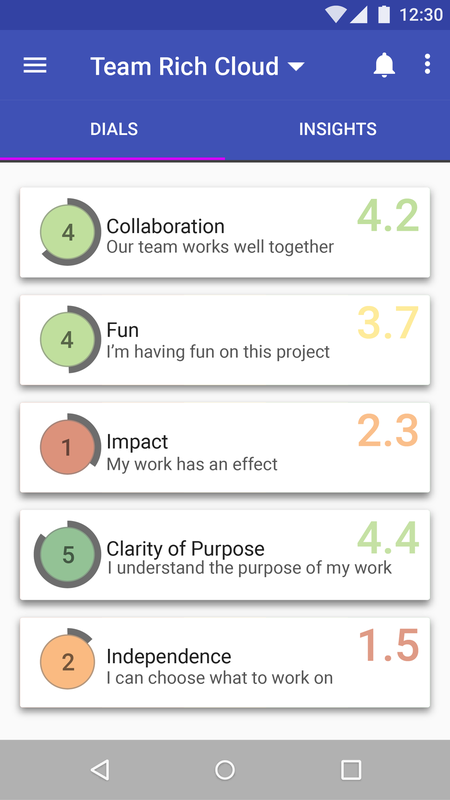 Kiwi Dials is a fun, free, mobile way for teams to measure their health and engagement, continuously, in real time. Because team health is highly correlated to success, companies can use the data we collected to identify projects that are at risk of future failure and intervene while there is still time to change the results. We offer the ability to compare local performance to broader benchmarks, by industry, or geography. The rest was up to us. I joined the design team at the outset and helped develop the design concepts. We sketched out ideas together and when the dust settled, I did all the prototyping in Axure, motion design, and visual comps using Adobe Illustrator. I ensured that the Android app specs were compliant with Google's Material Design guidelines, and also designed the iOS and Windows Phone apps. I designed the logo and typography and developed color standards. For the development team I delivered redlines to get them started on their weekly Agile sprints. 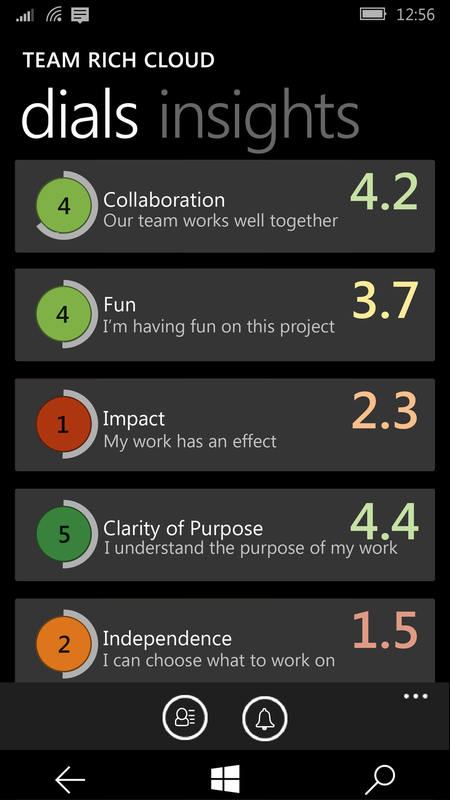 After we shipped Kiwi Dials on Android, iOS, and Windows Phone, I was paired with a Senior Dev and tasked with a collaborative process challenge: how to optimize the collaboration between designers and developers. The mission was to work together to figure out how to close the gap between designers and developers in a way that builds on their respective strengths and doesn't demand that either one stretches too far over the other side. One common approach to this problem is to ask designers to become more fluent in development languages, and as a result I've taken classes in basic HTML, CSS, and Java. Alternatively, developers can increase their design skills, but typically this isn't met with much enthusiasm from the developers. These approaches require designers and developers to carry a heavier load in areas that they may not have the interest or talent to be great in. The process we settled on allowed me to do all my work in Adobe and export CSS into a tool called codepen.io. The developers could see what I was doing in real-time, contribute content or change variables and see the CSS as codepen.io rendered it. When everyone was happy with the visuals and motion, the developers dropped the CSS into their development environment. The approach shortened our development cycle dramatically and largely eliminated fit and finish related defects. I designed the logo, typography, branding colors, branding tone guide, and the www.kiwidials.com website. I built early clickable prototypes in Axure and produced all the final visual comps in Adobe Illustrator for Kiwi Dials on Android, iOS, and Windows Phone, all of which are in production today. I also designed a web application which is currently under construction.